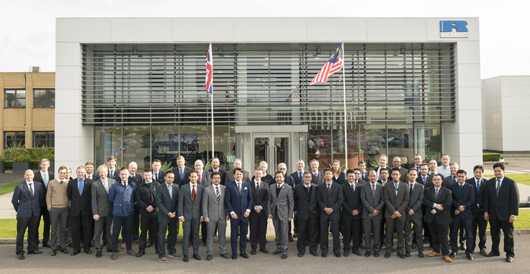 A live web link between the Ricardo Shoreham Technical Centre in the UK, and Proton’s headquarters at Shah Alam, Malaysia, was used on Monday 18th January for a joint celebration of the ‘first fire’ of the prototype of an innovative new engine family set to spearhead the next phase of the Malaysian automaker’s growth. The prototype engine which was formally fired for the first time at the ceremony, is the result of a design and development collaboration with Ricardo which started in April 2015. It is the first of Proton’s new family of three and four-cylinder engines – to include turbocharged gasoline direct injection (TGDI) variants – which are planned for market launch starting in 2017. The highly compact power unit has been designed from the outset to be compatible with Euro 6c regulations, providing significant opportunities for Proton to develop its position in the UK and other EU markets. Fuel-efficiency, driveability, cost-effectiveness and ease of service have been a particular focus for the new Proton engine design. Using its proven Ricardo combustion system technology, the new engine family will provide a strong low speed torque characteristic offering both a rewarding driving experience and excellent fuel economy. The engine’s design offers fast warm-up and is based on a low friction philosophy throughout. At the same time, it has been designed with a cost-effective cast iron block, enabling the use of Proton’s existing manufacturing facilities, and maximizes the use of common parts and assemblies across the entire engine family. The first prototype of the new engine family – a 4 cylinder 1.5 TGDI variant – was started remotely by YBhg Tun Dr Mahathir Mohamad, Chairman of Proton Holdings, who was among the approximately 200 people who attended the celebration in Malaysia.